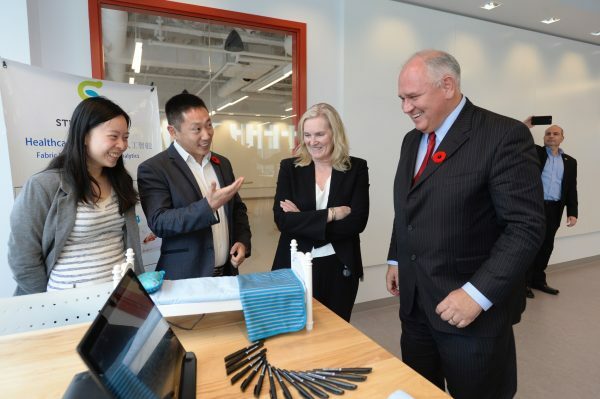 Entrepreneurs from Studio 1 Labs, which has developed a functional bed sheet patient monitor, explain the device’s function to York University President and Vice-Chancellor Rhonda Lenton and City of Markham Mayor Frank Scarpitti at the opening of YSpace. York University’s new co-working and maker space offers students and community entrepreneurs and innovators a place to build and scale their ventures, connect with industry and not-for-profit partners, and provides them with access to programs designed to build their entrepreneurial skills. With York’s Markham Centre campus scheduled to open in 2021, the University is actively taking steps to cultivate new connections that foster a strong and growing culture of teaching, learning, research and innovation. YSpace builds on the success of Innovation York, the University’s innovation office. Innovation York’s goal is to facilitate and maximize the commercial, economic, and social impacts of research and innovation, and to create a culture of engaged scholarship and experiential learning. A dozen startups that have benefited from Innovation York’s programs and services were at the official opening of YSpace to demonstrate how they have transformed their bright ideas into products and services, including: a cloud-based healthcare analytics platform that helps hospitals improve their efficiency and reduce costs; a new freeze drying technology which addresses the problems of affordability and efficiency of current freeze dryers; technology that provides media and entertainment options to users in rideshare cars and tracks behaviour; and finally, a one-stop shop for senior care.